VTech Sports Cars 3-Pack Just $10.78! Down From $30! Shipped! 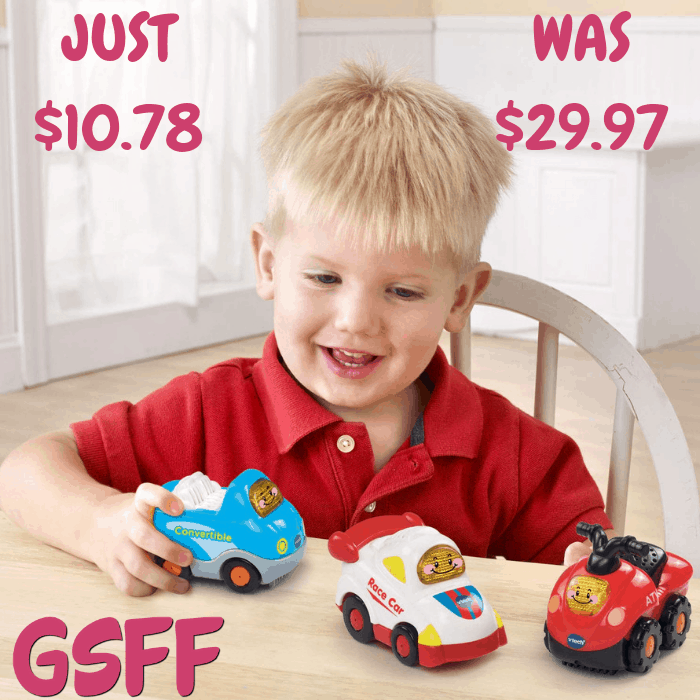 You are here: Home / Great Deals / Amazon Deals / VTech Sports Cars 3-Pack Just $10.78! Down From $30! Shipped! Amazon has this VTech Sports Car 3-Pack on sale for just $10.78 down from $29.97 PLUS FREE shipping! Race around the track, cruise in style or go on an off-road adventure with the Go! Go! Smart Wheels Sports Car 3-Pack! The set includes a race car, convertible and ATV. Perfectly sized for little hands, these electronic vehicles entertain children with a light-up button that activates music, sounds and phrases. Through pretend play, they’ll learn about the vehicles, letters and more. Each vehicle also responds to SmartPoint locations on Go! Go! Smart Wheels playsets and Go! Go! Smart Animals tracks!